Sada sošek Selvaria Bles a Juliana Everhart vytvořená podle předlohy figurální řady the game/anime “Valkyria Chronicles Dual” ( 戦場のヴァルキュリ DUEL ) vycházející z japonské formy dějového vyprávění anime je vysoká cca 15 cm a 12,5 cm s detailním zpracováním. 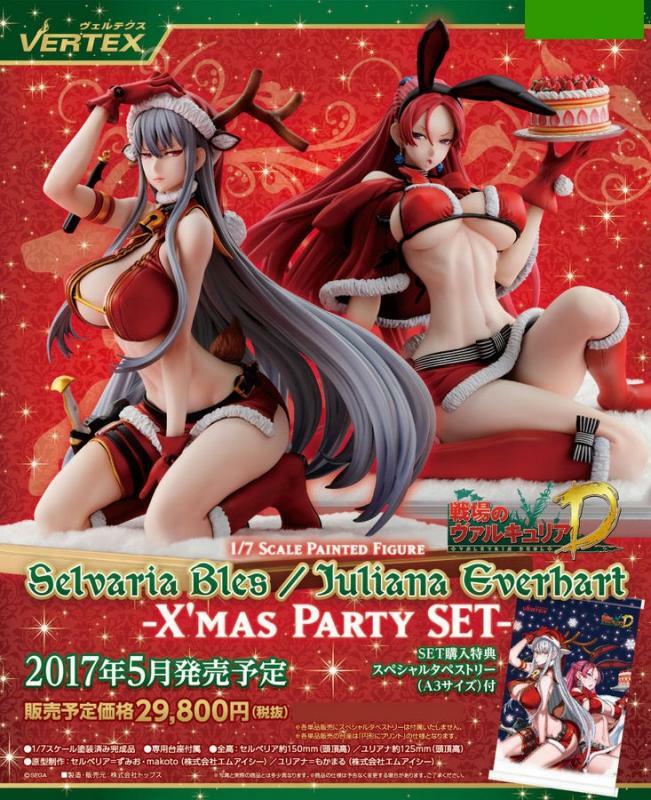 The 3rd volume of Vertex s "Valkyria Chronicles" figure series features Selvaria Bles and Juliana Everhart from "Valkyria Chronicles DUEL", dressed in a Christmas costume. The characteristic proportions drawn by illustrator Raita Honjou have been recreated faithfully. Depicted in their red Santa outfits, Selvaria with the Valkyria sword, red bra and cap plus antlers, Juliana with a strawberry cake, red bra and rabbit headdress, both seated on fur pads, they really pack a visual punch! Even the minute X-mas accents and accessories on their clothing and equipment have been perfectly replicated with amazingly detailed sculpting and painting. This is truly an amazing rendidion of the X-mas season! 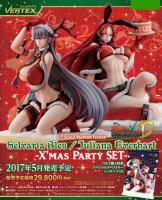 Vertex released the Selvaria Bles / Juliana Everhart ( セルベリア・ブレス／ユリアナ・エーベルハルト ) -X’mas Party SET- 1/7 PVC figure from the game/anime “Valkyria Chronicles Dual” ( 戦場のヴァルキュリ DUEL ). May 2017. Around 150mm tall, Juliana Everhart is around 125mm tall, 29,800 yen. Sculptor: Zmio, makoto (MIC). *The base with fur shown in the images is included plus: -Main figure (Selvaria Bles) -Main figure (Juliana Eberhardt). Sculptor of Selvaria: Zumio, makoto (MIC), Sculptor of Juliana: Mokamaru (MIC).